You can play the Grand slot from Quickspin for free now. This slot is different from a typical slot you expect at there 6 reels in different sizes and 214 paylines. We are not sure if you should play it so please try it now, before you play for real money. You play the Grand slot for free now and try to catch a good bonus on this Quickspin slot. 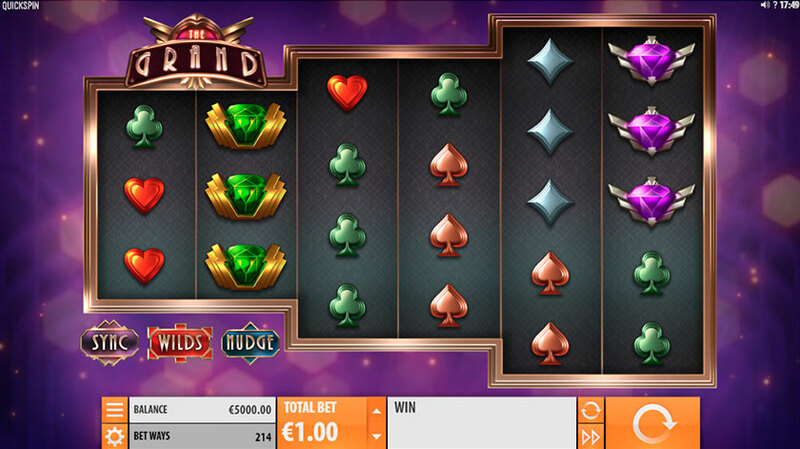 We are not sure if you like this type of slots, so it’s a good idea for you to play the Grand in a demo mode. To start your free spins you need to catch at least 3 free spins symbol, the more you catch, the more free spins you get. During your free spin, you need to catch three bonus symbols to add extra features. Nudge reels, sync reels and extra wilds. Hope a big win 2900x if you manage to combine all those three features. I personally don’t like this slot as it seems slow and lack of potential. Even if you land a bonus there still a chance for you to land only like 10x I suggest you play the Grand for free first and decide for yourself if you like it.